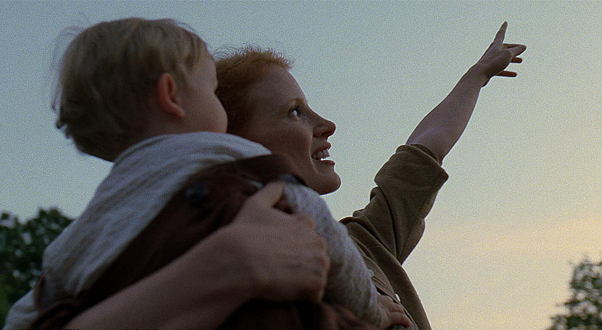 Arthur finally talked me into watching Terrence Malick’s Tree of Life and I enjoyed it much more than I expected to. Even the evolution-y, creation-y, impressionistic-y bit. Actually, especially that bit. And the dinosaurs (cheesy, I know, but I’ve got a thing for dinosaurs!) But this film is more than arty. It’s also a theological musing and it was on that level that I felt a bit hollow at the end. I was particularly interested in the mother character but haven’t yet come across a decent feminist analysis of her. She’s supposed to be the embodiment of grace in contrast to the father who struggles to either receive or give grace. But what sort of grace is it that she embodies? This sounds to me like the hymn about love in 1 Cor 13. Grace, I suspect, is something different. This definition is pretty passive. In my view, grace is more about giving than receiving. It’s active. The mother is anything but active. She accepts her husband’s treatment of the boys in virtual silence. There are a few moments of rebellion on her part but they come in the heat of the moment and there’s no change afterwards. She’s adored by her boys but perhaps not respected by them. We see an attempt at disciplining toddler Jack and an admonishment later on to ‘not do it again’, but no discussions that shape his character or help him to interpret the world. For all the fun she brings to his life, she’s not a safe place for Jack to admit shame or disappointment. It’s a pre-feminist world, before divorce or, perhaps, any robust concept of the personhood of women. In a way, she is just as much a prisoner to the father’s ‘way of nature’ as the boys. In this captivity as well as in the hardships that befall her, it is her faith that sustains her. Near the start of the film, there’s a beautiful voiceover of her reading a Psalm of assurance and at the same time questioning it. But if her faith is enough for her, it is not enough for Jack. Indeed, it is his younger brother RL, who transforms his outlook and behaviour when he forgives his brother for the incident with the air gun, though perhaps RL is imitating his mother. There’s joy in the mother’s approach to life that might be termed common grace and she shares in and imparts this wonder to Jack. A verse from the Yahweh speeches of Job opens the film, fittingly so, for both ask questions about where the stupid or the futile fit in the magnificence of God’s order. However, a crucial element of the Yahweh speeches is the presence of God, that he condescends to speak to Job, to reply to the man who is accusing him. Whatever else the speeches are, they are an endorsement of Job, an astonishing willingness to engage with him. No such element is present in the film: this God may sustain creation and possibly have an order, but he is distant. The end sequence of the ‘new creation’ offers some suggestion of the nearness of God if the woman Jack is following is some sort of God-like figure and there’s a sense of reconciliation. But how has this become possible? Is all between the father and his sons swept away with the old earth? This is where the life and death of Christ have something to say to the mother. While Jesus accepted insult and injury (the ‘grace’ of Tree of Life), turning the other cheek for him did not mean leaving the helpless vulnerable. Take the woman of Luke 13, for example. She’s not just physically incapacitated but held captive by Satan and he restores not only her body but also her community. Jesus’ incarnation testifies that God is not distant; his life shows us he cares and does something about it; in his death we see the culmination of that care in an all out defeat of evil; in his resurrection and ascension we understand that his rule and promise are sure. Jesus is God’s great identification with humanity and demonstration of God’s love for us. It’s far richer than merely ‘not trying to please himself’: it has a redemptive and transformative purpose. I love the way Tree of Life grapples with questions of suffering and God’s order. However, the biblical language and imagery rang a little hollow. The questions the film poses find fullest answer not in philosophy or even in mystery but, like the Yahweh speeches, in the presence of God. For the mother, this is also the context and precedent for a more robust faith, one that gives warrant for action, strength and care.